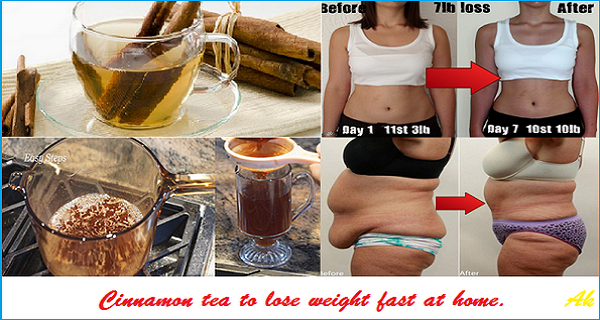 THIS IS THE CORRECT WAY TO PREPARE ORGANIC CINNAMON IN ORDER TO LOSE WEIGHT! Cinnamon is a spice with sweet smell that adds richness in the flavor of apple and pumpkin pastries, but it can also be used in teas, coffees etc. Cinnamon crust, which is the ingredient we need for cinnamon tea is made of the cinnamon tree and you can use it powdered or in sticks. Cinnamon is naturally low in calories and it can help you regulate your blood sugar levels, you’ll consume less calories and it will also help you decrease weight. 1 cup of cinnamon tea contains only 2 calories as a portion, so if you drink it often, you’ll get used to intake smaller number of calories. 1 cup of soda cream contains 126 calories. If you take cinnamon tea once a week for one year, you’ll lose much more calories than with any other drink for losing weight. Mix the cinnamon with the honey and the lemon juice and add the mixture into the cup of water. Leave it to dissolve well for several minutes and drink!